Concept nova3 / enables us to impact-test any design virtually before building a 3d model. In-moulding intelligent fusion/ different density of material depending on the charcteristics of each model. Homothetic embedded skeleton/ dissipates the force of impact over the whole shell. Compatibility/ compatible with most available neck braces and goggles. We do advise you to try on before purchase. No hearing loss/ it is fundamental for safety to be able to hear well, even when you have pulled on your helmet. Front pad gel o2 / hypo-allergenic, anti-bacterial, made from thermo-stabilising polyurethane morpho-gel. Keeps you cooler. Kevlar™ straps / ventilated, with breathable and ultra-resistant they have numerous advantages over traditional straps. Lateral dividers strong fit/ positioning them correctly, then blocking them in the chosen position is child’s play. Embedded straps anchoring points/ improves the aerodynamics and the strap’s tensile stress is more evenly dissipated in case of impact. Retention system safe-t smart / includes a vertical adjustment. Broader contact area, the pressure is distributed in a homogenous way. Visor with integrated air intake / actively helps cool the head by directing the air towards the inside of the helmet. Mx type adjustable visor/ tool-free angle adjustment. The peak is attached using anodized aluminium screws. Integrated chin guard / its design was dictated by our search to find the best ratio between max protection and minimum bulk. Reflective rear sticker/ at night or in tunnels, makes the bike visible to drivers approaching from behind. Removable kit for camera mount/ stick your camera mount to our mopov support. Leaves your helmet clean and tidy when not filming. Goggle lock/ keeps your goggle strap in place on the helmet. parachute - in case of mountains - megavalanche from met board on vimeo. 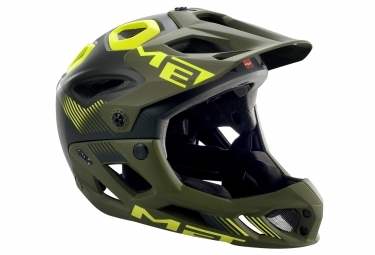 Casque intégral Met PARACHUTE Vert Noir clasificado 4.6 de 5 por 23.